Q: What are these people wearing? Answer: Yukata. There are several differences. Kimono are made of silk, while yukata tend to be made of cotton -- for this reason, yukata are worn in the summer, when Japan is very hot. Kimono have at least two collars, while yukata only have one. Kimono are never worn without socks, while going without them is fine when wearing a yukata. Q: Why should you always wear your kimono with the left side wrapped over the right side? A: Because you are alive! Right-over-left is reserved for corpses being dressed for funerals. So if someone is walking around wearing their kimono that way...the zombie apocalypse is upon us. Why should you tie your obi with the knot in the back? A: Because tying it in the front is a symbol of prostitution. Would I be wrong in saying that a yukata is actually a type of kimono? A lot of sources seem to outline this fact. It's my understanding that yukata isn't kimono. Yukata and kimono are different in the same way that pj's aren't a suit. 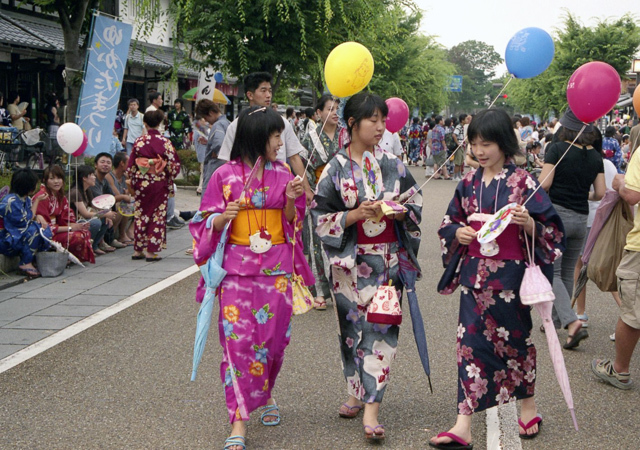 There are many, many different types of kimono but yukata isn't one of them. The original meaning of "kimono" is simply "clothes", and before 1850 or 1900 or so that's all it meant. (Literally it means "thing which is worn".) As western clothes became more common in Japan "kimono" began to refer specifically to Japanese (as opposed to western) clothes and to the formal robes we think of the term as referring to. The older sense still remains though, so depending on context "kimono" can mean any clothing, including jeans or a t-shirt. But even leaving that aside, Geography guy is basically correct that yukata is considered a kind of kimono. If you bought a book about kimono it would have a section on yukata; if you took a course on how to wear kimono you'd learn the yukata at some point. But EXE's question still works, klaxon and all, because while a yukata is a kind of kimono the words aren't used interchangeably. That is, if you asked Japanese people what the girls in the photo are wearing they they wouldn't answer "kimono". (The photo is actually of a yukata festival.) It'd be a great question for the show! That's quite interesting, when playing competitive Judo my (and any other judoka's) obi was always tied at the front, tying as you suggest would facilitate a broken spine when thrown on it. What's more our gi was invariably closed right over left. Does that make us all dead prostitutes? Dr Fell, if you were doing judo recently with your gi closed right over left, technically you could have been disqualified! Under international rules, anyway. According to some googling the rule only came about after the 1996 olympics, when a relatively unknown woman from North Korea won the gold with her gi tucked in the wrong way round, and some felt it was a ploy to make it harder for her opponents to get a grip. But anyway, in Japan anything robe-like is always worn with the left side (from the wearer's viewpoint) outermost, for both men and women. For western-style clothes with buttons it varies with gender as in the west. As for the belts, there's no particular association between prostitutes and wearing the knot in front. I think it would be more correct to say that there's a style of kimono that's associated with courtesans and prostitutes, and that style is also the only style I'm aware of where the knot is worn to the front. If you do a google image search on "oiran" (or on 花魁) and you'll see what we're talking about. ... our gi was invariably closed right over left. Interesting. Aside from the fact that nobody ever told us there was a right and a wrong way, I and (I think) everybody I knew would close the gi left over right. I don't know why, exactly, it just seems more natural. Did you have a class of left-handers? I and (I think) everybody I knew would close the gi left over right. I don't know why, exactly, it just seems more natural. That raises the question of how the custom arose, and there are a number of theories. One is that it was easier for a right-handed person to draw a sword from his left that way. Another is that the Han Chinese (from whom the practice apparently came) wore their robes that way to differentiate them from northern "barbarian" hordes (who used bows from horseback, and wore their robes right-over-left so the bowstring wouldn't catch). Either way there are records of a Japanese law from 719 that dictates the current norm. The origin of dressing dead bodies the opposite way has competing theories as well. The usual view is that it's just a matter of otherworldliness, but several sites claim that in Han Chinese practice right-over-left was reserved for people of high rank, and that dead bodies were dressed that way to denote that all were equal in death and rank no longer applied. I have just consulted my Dad (84 years old, 3rd Dan, still practises Tai-Chi twice a day) and I stand corrected, but the rule was not i force when I was active. It also made doing my obi up easier. Memory flagging, clearly (mine not his).